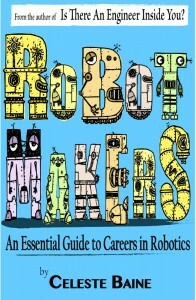 Win a copy of Robot Makers! To enter, send an email to me with just one word that describes a robot. It can be a robot you built or one that you saw. It can be any color and programmed to do any task. What do you think of when you see a robot? Your entry should be just one word. One winner will be picked at random. Tune in next week on Tuesday morning, October 6, 2015 to see if you take home the prize.